In Photoshop Elements, you use the Toolbox, or Tools panel, to apply effects and techniques, such as masks, selections, brushstrokes, and more. 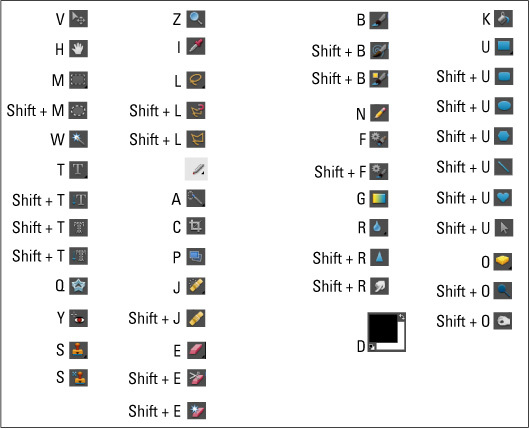 The following figure shows you at a glance what keyboard shortcuts enable you to access tools in the Photoshop Elements 8 toolbox. The last tool used requires pressing the Shift key and then the keystroke. For example, if the Elliptical Marquee was the last tool used, press Shift+M to return to the Marquee tool.